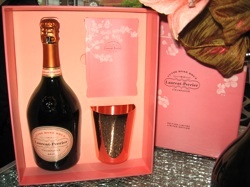 The recession's obviously not hitting everyone (those lucky people), because Laurent-Perrier Champagne's winter holiday partnership with Baccarat crystal went so well that the two have teamed up again to bring you yet another exclusive opportunity. This time the two companies are celebrating spring, with two different types of packaging. 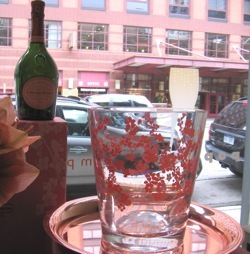 The first, available only at Fox & Obel (and F&O is one of the few places in the country that will have this), is a bottle of Laurent-Perrier's Cuv é e Ros é Brut with a large Baccarat crystal vase. It retails for $1200. The second item contains a smaller vase along with a bottle of the Ros é . It's available at both Fox & Obel and Urban Harvest for $225. Maybe you aren't into crystal or vases, but you do like the bubbly. On its own, the Ros é itself is really quite delicious and is only $100 a bottle.